Created by Ron Link (Canadian Skat Champion and member of the 2006 and 2008 Canadian Skat World Champion Teams) and Michael Buro (developer of the International Skat Server and 2008 Alberta Skat Champion), "SKAT-Link, The Ultimate Card Game" is produced in Canada and sold world-wide to teach and promote the game of Skat. What is Included in the Game Box? 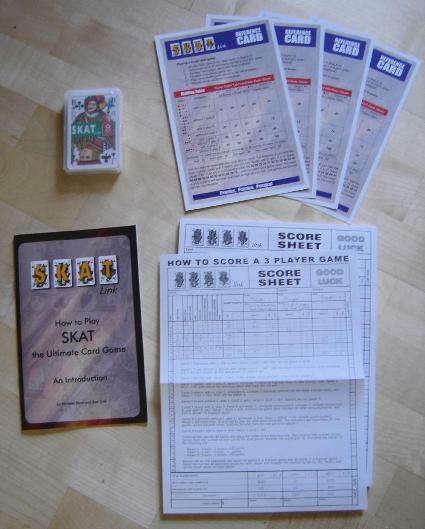 The box includes a valuable how-to-play instruction booklet, a deck of Skat cards for beginners that eases the transition from anglo-american to German face cards which are commonly used in Skat tournaments, four shiny game reference cards, and 50 double sided score sheets with instructions. This makes a great gift for friends and family! The suggested age for playing Skat is 10+. The game can be purchased online and through more than 20 retail locations across Canada (list). We recently added to the box the description of a game we call Skat-101 that teaches beginners the basic concepts of Skat such as trick-taking and counting card points without the complexities of bidding. You can get download it here for free. Skat? The Highest Rated Card Game! BoardgameGeek rates Skat at 7.3/10 - the highest score of any card game, and the book of Hoyle gives it 3 stars out of 3. Skat is a 3-handed trick-taking card game that originated in Germany around 1810. 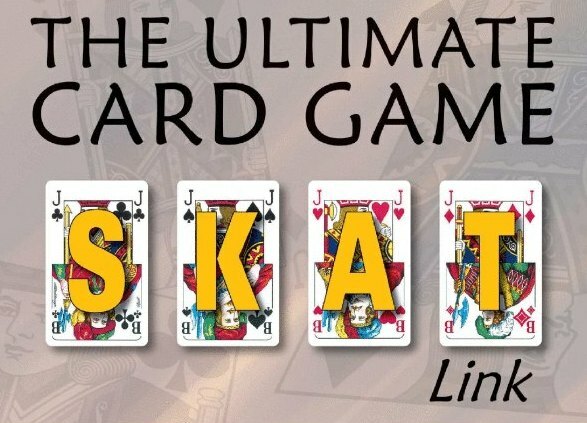 Combining elements of Bridge, Hearts, Euchre, Pinochle, and Poker, Skat is the most exciting card game in the world, in which skill actually overpowers the card luck factor. Skat is played world-wide with organized clubs and tournaments in many major cities. With "SKAT-Link", you too can learn to play the ultimate card game and test your card-playing skills. Be one of thousands of players world-wide who say there's no better card game of skill. Challenge, fellowship, and fun for the whole family, that's Skat! For a quick game introduction go here. You can also download pdf-files for the booklet, the reference card, score sheets, and scoring instructions from this site to print them for personal usage.